How to Remove Gandcrab v4 Ransomware? The Gandcrab ransomware is nothing new in the cyber crime field. So far, there have been three separate versions of it, plaguing users. And, now, it’s making yet another comeback. The Gandcrab version 4 is out and about, and users are crying out. The ransomware slithers its way into your system, and doesn’t waste time. It runs a full system scan, in search of files to encrypt. It proceeds to lock every single file you have, and doesn’t let you access anything. The only exceptions are files that are essential for your operating system. Everything else gets locked, and becomes unreachable. Photos, documents, videos, music. It all falls under the infection’s control. Gandcrab v4 uses a complex combination of encryption algorithms. That includes AES-256 (CBC-mode), Salsa20 and RSA-2048. It adds the specific ‘krab‘ extension at the end of each file. Thus, solidifying its hold over your data. Once the extension gets added, that’s it. You can longer reach your own files. After the encryption is complete, the infection leaves you a note. It’s called KRAB-DECRYPT.txt, and it contains its demands. The ransom note explains your situation, and lists several requests. They include the following. The ransom must get paid in Bitcoin. The exact amount may vary. But it tends to stay in the range from 200 to 1000 US Dollars. You must purchase a unique decryption key to unlock your data. To do so, you must reach out to the cyber kidnappers ASAP. Every minute you waste may end up costing your files. The cyber criminals may threaten to delete some of your files, if you delay payment. Heed experts’ advice, and do NOT pay a dime! Don’t contact these people. Don’t call, don’t write, don’t do a thing. The best course of action is to cut your losses, and say goodbye to your data. It’s a tough call to make, but it’s the right one. The nasty infection slithers its way in via deception. It resorts t slyness and finesse, and invades undetected. Yes, it gains access to your PC, without you even realizing it. You only become aware of its stay, once you get greeted with your data locked. But how? How does Gandcrab v4 sneak in unnoticed? Well, it preys on your carelessness. That’s right. The tool only pulls off its deception, because you allow it. You give into naivety, and rush. You throw caution to the wind, and skip doing due diligence. And, that opens the door to the horrendous cyber threat. The tool uses spam email attachments, corrupted links or sites. Of course, freeware is always an option. It can also pose as a bogus update. Like, Adobe Flash player or Java. There’s a multitude of methods, it can turn to. It’s up to you to look through its deceit. And, spot it attempting infiltration. You’re the last line of defense! Choose caution over carelessness. Take the time to be thorough, and remember that vigilance keeps threats out. The lack thereof invites them in. Why is Gandcrab v4 dangerous? Here’s why, saying goodbye to your files, is the right thing to do. Don’t forget that you’re dealing with cyber criminals. The people, behind Gandcrab v4, are malicious third-parties. They’re unknown individuals with questionable intentions. Do you expect these strangers to keep their word? To follow through on their promises? Don’t be naive! These people only want your money. They don’t care about your files. Once you pay, and they get your money, that’s it. They have reached their end-game. With or without making payment, the result is the same. You will NOT get your files back. The only safe and proper way to get a hold of them is through backups. Either cloud services, or external storage. Otherwise, they’re as good as lost. 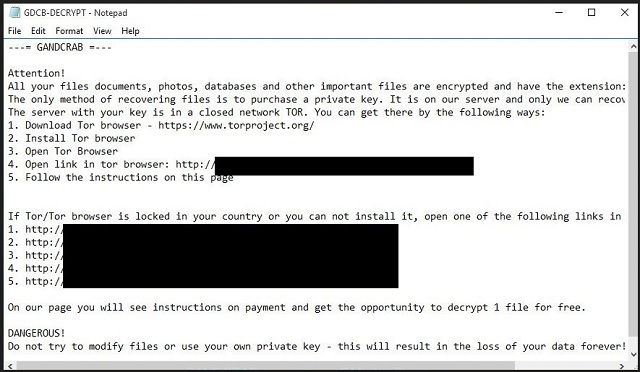 The ransomware may promise to sell you a decryption key, but can you expect it to? What if it gets your money, and doesn’t send a key? Or, sends the wrong one? And, even in the off-chance that it gives you the right one, what then? You may decrypt your data, but the reason it got encrypted, still lurks on your PC. What if it acts up again, and locks everything once more? Will you continue to throw money at the cyber criminals behind Gandcrab v4? Make the right call. Forget about your encrypted files. Gandcrab v4 forces you into a game that’s set up for you to lose. Accept that, and move on. Locate any suspicious processes associated with Gandcrab v4 encryption Virus. Gandcrab v4 may have the ability to replicate itself, if not completely cleaned. This may require tracking down hundreds of files and registry keys. You can choose to use Spyhunter Professional Anti-Malware Program to deal with any infection that might be lurking along with Gandcrab v4!